In this work, the taxonomic study of Salvinia from the southern and southeastern regions of Brazil is presented. We analyzed materials from herbaria BHCB, BHZB, CAY, CESJ, CVRD, DIAM, ESAL, FLOR, FUEL, FURB, HAS, HB, HBR, HUFU, HURG, ICN, MBM, MBML, OUPR, PACA, R, RB, SJRP, SP, SPF, SPFR, UEC, UPCB, VIC, VIES, plus online images of types, and field studies. In southern and southeastern Brazil, nine taxa of Salvinia occur, of which two are new to science: S. auriculata var. major C.V. Miranda & Schwartsb., var. 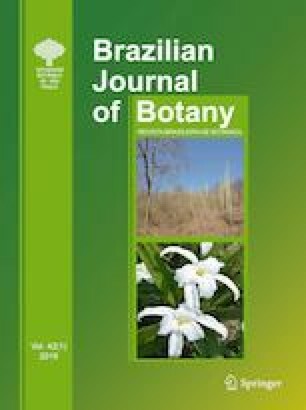 nov., S. biloba Raddi, S. cucullata Roxb., S. × delasotae C.V. Miranda & Schwartsb., hybr. nov., S. herzogii de la Sota, S. oblongifolia Mart., S. minima Baker, S. molesta D.S. Mitch., and S. radula Baker. Salvinia cucullata and S. × delasotae are cultivated taxa, not occurring naturally. Based on studies of plants from French Guiana, we concluded that S. auriculata s. str. (= S. auriculata var. auriculata) does not occur in southern and southeastern Brazil. Updated nomenclatural headings, descriptions, illustrations, key, and maps of distribution of all taxa are also presented. The senior author thanks Coordenação de Aperfeiçoamento de Pessoal de Nível Superior (CAPES) for the fellowship. All authors would like to thank Programa de Pós-Graduação em Botânica (Universidade Federal de Viçosa) for partly paying the costs of this work, Reinaldo Pinto for the illustrations, and the following people for helping in the field and support: Nayara S. Smith-Braga, Fernanda L. Gotti, Andreza G. da Silva Oliveira, Laura S. Rabelo, Jaquelini Luber, Nelson Túlio L. Pena, Rosana Senna, Eduardo Guatimosim, Ana Rolon, Guilherme M. Naman, Márli de Souza, Ademir Reis, and Ronaldo Vinícius-Silva. CVM conceived and designed the experiments, performed the experiments, analyzed the data, wrote the paper. PBS conceived and designed the experiments, analyzed the data, wrote the paper.